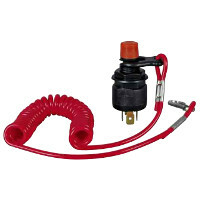 Marine emergency cut-off switch with lanyard, cut-out can can also be operated with lanyard clip in place by pressing knob, suitable for coil or magneto ignition. 6.3mm blade terminals, 16mm panel hole. 15 amps at 12v dc rating.